Albert Richard Shilston was born in Yeovil in the spring of 1892, the son of coalman Henry Shilston (b1866) and Mary Ann née Newcombe. Henry and Mary had three children born in Yeovil; Henry (b1889), Anne (b1890) and Albert, but by the time of the 1901 census they had moved to Southampton, Hampshire, where they shared a house with another family at 19 Victoria Street. By 1911 Henry was boarding at Eastleigh, Hants, working as a turntable attendant on the London and South Western Railway, while Mary, together with Albert and Annie, had moved to London and was living in two rooms at 6 Lindsey Buildings, Macklin Street, Bloomsbury. Mary worked in a laundry doing the ironing, Albert was a fishmonger's assistant and Annie worked as a restaurant waitress. Albert enlisted at Hammersmith, joining the 2/19th (County of London) Battalion, The London Regiment (St Pancras). His Service Number 612059 indicates that he enlisted in 1917 since enlistments into the Territorial Force were renumbered in 1917, the 19th Londons did so within the range 610001 to 630000. Having been fighting on the Western Front continuously since June 1916, on 1 November 1916, the 2/19th Londons, as part of 60th Division, was ordered to prepare to move to the Macedonian front, and the battalion embarked at Marseille on 25 November, landing at Salonika on 1 December. It began the march north on 18 December and went into the line on Christmas Eve 1916. The battalion was peripherally involved in the Battle of Doiran 24–5 April and 8–9 May 1917. The 60th Division was next transferred to the Egyptian Expeditionary Force for the Sinai and Palestine Campaign. The 2/19th left Lake Doiran on 1 June 1917 and marched back to Salonika where it embarked on 10 June. After a period of training and acclimatisation in the Canal Zone, the battalion moved up to the front in July 1917. On 31 October the battalion was with 180th Brigade in divisional reserve for the Battle of Beersheba, but the attack was so successful that it never came into action. The Battle of Hareira and Sheria was fought on 6–7 November 1917 when the Egyptian Expeditionary Force attacked and captured the Yildirim Army Group's defensive systems protecting Hareira and Sheria in the centre of the Gaza to Beersheba line, during the Southern Palestine Offensive of the Sinai and Palestine Campaign. On 6 November the 2/19th was one of the attacking battalions that captured the Kauwukah position during the Battle of Hareira and Sheria. The Sheria position remaining untaken, the brigade attacked again the following day, 7 November 1917 and the 2/19th suffered heavy casualties, including Albert Shilston. He was aged just 25. 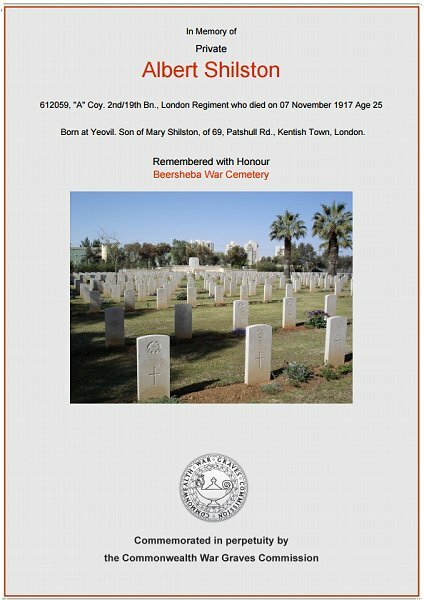 Albert was interred in Beersheba War Cemetery, HaDarom (Southern District), Israel - Grave N.75. His name was added to the War Memorial in the Borough in 2018. The Commonwealth War Graves Commission certificate in memory of Albert Shilston.